So you’ve survived the innocuous extra day that gets tacked onto February once (almost) every four years. Leap year is something most people don’t really think about. Which is kind of too bad. We’ve made it very easy to overlook something rather extraordinary—the fact that the rate at which our Earth revolves around the sun is not in precise agreement with our 24-hour day. Early solutions to this observation were admittedly rickety. The pre-Julian Roman Calendar is as delightfully complex a calendar as you might find. Every other year, the short month of Intercalaris was inserted toward the end of a truncated February (most scholars agree) on a roughly alternating schedule as to whether Intercalaris was 23 or 24 days. Since the “standard” Roman year was 355 days, and the “special edition” year was 378 or 379, it averaged out reasonably well as long as someone paid close attention. However, the office of the Pontifex Maximus, the most powerful priest in Rome, was in charge of a lot of things, including the calendar. Of course, if he was busy, say during a Civil War, or the Second Punic War, the Pontifex Maxiumus might not get around to properly assigning the year. Or it might be that the current Pontifex, an elected official, might want to assist his political cronies by making the transient month arrive sooner rather than later, extending their term in office. Unsurprisingly, the calendar did not always work as simply as it seems in print. Julius Caesar, setting up reform and establishing the Julian calendar extended the year 46 BC to 445 days in order to bring the following year back into seasonal alignment. To do this, he inserted the usual Intercalaris in February, as well as another 23 days into November, and 22 more into December. After that, he established the familiar 365 day calendar with a leap year tacking an extra day onto February every four years. In light of the Julian reform, the Roman Calendar looks cobbled together, but it was a calendar based on observation and constant attention. It worked as long as it was properly maintained. Like a lot of the side-projects of the high and mighty, time and attention were a problem. What Julius “Shakespeare wrote a play about me” Caesar did was to simplify the calendar so that anyone who knew the leap-year rule could make their own calendar, rather having it issue from a specific office every year. And the Julian calendar worked pretty well for fifteen hundred years, but it hadn’t been worked out to enough decimal places to be eternal. In 1582, the Gregorian calendar (named for Pope Gregory XIII), instituted a new refinement. The Julian calendar declared that all years divisible by 4 were leap years. The Gregorian rule is a bit more complex, stating that every year that is divisible by four is a leap year, except for years divisible by 100. Centuries that are divisible by 400 are leap years. Thus 1600 was a Gregorian leap year, while 1800 was not. However, because the Julian calendar was now some ten days off meeting solar equinox with calendar equinox, ten days would have to be lopped off the current year of any country that adopted the Gregorian calendar. And of course, European countries wanted to display their allegiance or defiance of the Pope and his newfangled calendar. So there is a lag of some 300 years during which Western Europe slowly converted to the Gregorian calendar. The Orthodox church still hasn’t, which is why Eastern Orthodox holidays are celebrated some twelve or thirteen days after Catholic and Protestant ones. The delay among countries adopting the Gregorian calendar has resulted in some interesting quirks of calendary. For real giddy fun, consider that Shakespeare and Cervantes died on the same date (April 23, 1616), even though Cervantes predeceased Shakespeare by ten days. Spain was using the Gregorian calendar at that time, while Britain was using Julian. So the apparent simplicity of the additional day of February that makes little impression on you has been the result of a lot of hard work, finagling, and political chicanery. There is absolutely nothing sinister about this. Unless you count in the fact that Feb 29 is Tim Powers’ birthday, which makes it just a touch suspicious. I took Saturday and went to Boskone 45, Boston's largest and primarolty literary SF convention. There I met several Neconites and using information gleaned from them, crashed the New England Horror Writers' dinner. And I met (OK, met and remembered, because I've apparently met Jack before) Jack Haringa, who is cool, classy, a great conversationalist, and a also an appreciator of Muppets, Nick "I don't have to write, I'm a Stoker-Nominated author!" Kaufmann, Paul G. Tremblay, F. Brett Cox, who , it turns out, works at the same university my father used to, Lon Prater, and of course Nick Mamatas. I did a lot of networking, at least as far as I could shout down the table. I'm interested in following the development of the latest horror award, the Shirley Jackson Awards, and not just because I've been to her house. Jackson is, however, the origin of the myth that we stone people to death in Bennington. This is a dirty lie—Jackson lived in North Bennington. The collaboration between David Conyers and I has been sent off to the editor. I think it came out rather well, and am hoping that it gets into the anthology. 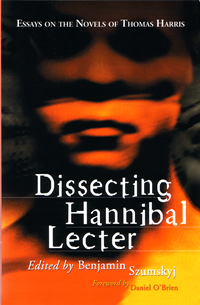 Dissecting Hannibal Lecter has come out, with my essay "Hannibal at the Lectern: A Textual Analysis of Dr. Hannibal Lecter's Character and Motivations in Thomas Harris's Red Dragon and Silence of the Lambs"
"What does he do, this man you want?" Ah —" [Dr. Lecter] said sharply, averting his face for a moment from her wrongheadedness. "That's incidental. What is the first and principal thing he does, what need does he serve by killing?" Lecter applies this reasoning to Buffalo Bill, but what if we apply it to the good doctor? There are also magnificent essays by ST Joshi, Davide Mana, Peter Messent, Philip Simpson, Robert Waugh, as well as editor Benjamin Szumskyj. I had a good time playing with my brother at Templecon, a large east coast Warmachine convention. I didn't win any prizes, because my style of play, which is to not commit fully until the enemy makes a mistake then pounce on him, really isn't as consistently effective as having an well thought-out plan. And I still have that competitive edge that makes losing a too-personal experience for me. I get that uncomfortable feeling in my stomach, and the face-too-tight sensation when I watch my opponent really gain the upper hand in a match. Although after six months of play, this has eased off a bit. I doubt it will ever actually stop bothering me, but I think repeated defeat in public will continue to erode that humiliating feeling of utter failure when I am beaten. The games had many interesting moments, the most visual of which is below. 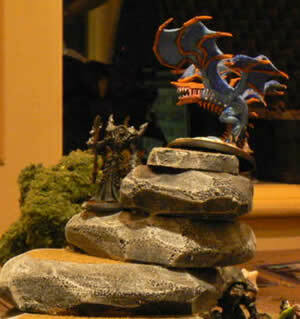 My Iron Lich Asphyxious (in black) fighting a Seraph (in blue and orange) on a tall rocky pinnacle. Asphyxious did not actually kill the Seraph; he severely hurt it and threw it off the tower. It was the Slayer jack (at bottom right) that struck the killing blow. Outside of the game itself, I'm enjoying painting Warmachine models (you can see some on my website). It takes a bit less talent than I had originally feared. And it's a good rest when I'm brain-tired from writing.